When Grant says fanatical support he means it! I got an email from him while he was on vacation to Mt Everest. He actually answered my email from the middle of nowhere at 5300 meters above sea level. He is crazy! We used Local Scraper to gather addresses for a massive direct mail campaign. It literally saved us thousands of dollars. I couldn't be more happy. Our latest website could have never been possible if it wasn't for the database we were able to build with Local Scraper. Buying Local Scraper was one of the best things my company has done, we use it almost daily. Since we started using Local Scraper our business has increased at least 10x fold. It's been an amazing asset to the company. "Scraping Data from Google Maps has Never Been Easier." Google Maps is the definitive source for data on business listings. No one has more data than Google Maps does. But they are not going to share that data it with the rest of us. That is why you need a Google Maps Scraper. With a scraper such as Local Scraper you can simply collect the data that you want from Google without using any APIs. Use their data to populate your own databases of business listings, send out mass mailing campaigns, or just collect it for lead generation. 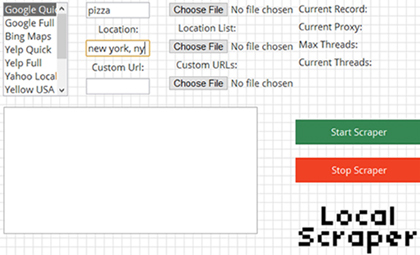 Local Scraper is a fully automated scraping solution. It offers the ability to scrape data simply by entering a keyword and location and pressing a single button. The scraper will then open your web browser, go to google maps, enter in your search and then being to scrape information. It will automatically click on each listing and follow though search pages. In the bottom of the program you will be able to watch as business data is automatically populated into a table. This same information has been saved automatically to a CSV file as it continues to scrape. With this solution no data will be lost while scraping. We have been in the scraping business for over 5 years now and were one of the first scrapers on the market to scrape data from Google Maps. Scraping data is our business, using that data is your business. What to know more? Click the button on the left to learn more about scraping data from Google Maps. Here is some data you could be scraping from Google Maps. The Google Maps Scraper is part of the Local Scraper Package! © Copyright 2019 by Local Scraper. All rights reserved.